Inspiring Art Teachers to Explore Art History | Curator’s Corner: Have You Had Your Fiber Today? As you all know, I’m not a fan of the words “decorative arts,” “artisan,” “crafts,” or “craftsperson.” I think we’re way beyond that now. 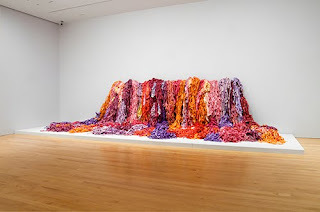 If any artist exemplifies how far from “craft” certain art forms have come since the early 1900s, it is Sheila Hicks. She has transformed fiber arts into installation art. Her early pieces were BIG, but her latest installations are huge and gorgeous. Hicks was at the forefront of the transformation of textile arts from “craft” to fine art already in the late 1950s. The evolving Feminist Art Movement of the early 1970s focused attention on art forms traditionally considered "women's work," a major example being fiber arts. This revolution in the perception of textiles was pioneered by many women who had studied under Bauhaus textile artists, particularly Anni Albers (1899–1994), who taught at Yale University after leaving Germany. The movement reinvigorated traditional types of fiber art such as wall hangings, quilts, and tapestries, but also encouraged artists to explore new genres of fiber arts that transcended two-dimensional forms. Hicks was born in Nebraska and received both a BFA and MFA from Yale University. She studied under both Anni Albers and Josef Albers (1888–1976), initially to become a painter. 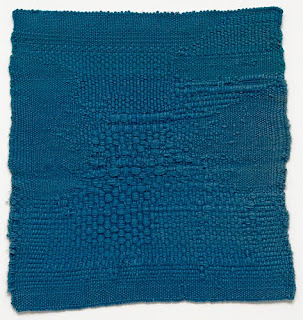 That all changed when she received a Fulbright scholarship to study painting in Chile (1957 to 1958), and Anni Albers suggested that she study the indigenous textiles for the vibrant use of color. That was all it took to hook her on fiber arts. She subsequently studied the medium in Mexico and South Africa, opening workshops in both places. Her name is now forever linked to the fiber medium, and her work has grown in both concept and size. Her room-sized installations are mind-blowing! While still at Yale, Hicks's habitually carried around a portable hand loom on which she experimented with various techniques and combinations of techniques when inspired in her daily travels. She has called these study works of the last fifty years "minimes." Minimes invariably explore a variety of stylistic anomalies that are unique to Hicks' body of work. Blue Letter is a double-sided minime weaving in which she incorporated hieroglyphics into the texture by varying the width of the warp. It is an early example of how Hicks brought the textile arts medium to the threshold of crossing into sculpture. 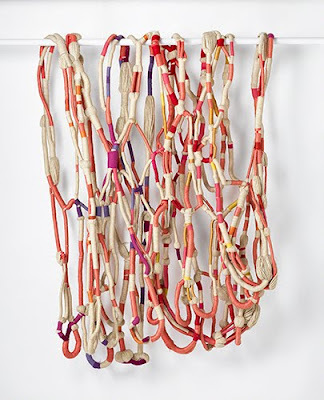 Hicks’ fiber works span the media of painting, architecture, sculpture, and textile. Color is the focus of practically all of her works, reflecting the impetus for her turning to fiber arts in the first place while thinking she wanted to be a painter. Her sensitivity to color helps augment the sculptural quality of her pieces, particularly in works like Wow Bush, which dominate the gallery not only by size but in the brilliance of the color.